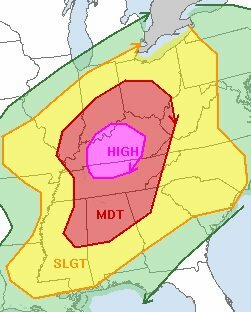 All week, computer models pointed to a couple of potential severe weather threats, one on Wednesday February 29 and a greater threat for Friday March 2, 2012. Wednesday’s “event” produced no severe weather in North Alabama. By Thursday, the Storm Prediction Center included North Alabama in a “Moderate Risk” for severe weather. All parameters seemed to be coming together for the potential for all forms of severe weather, including tornadoes. Thursday evening I poured over models and maps looking for as much insight as I could get for the chase. I communicated with several of my weather friends, including Jason Simpson, Chief Meteorologist at WHNT Channel 19. I spoke with chase partner John Brown about his plans and what he was seeing in the model output. I also spoke to Meteorologist Barry Britnell, Jennifer New, and Carrie Rumbo about posting on my Facebook weather page and communication while I was in the field. Earlier in the week I had spoken with Sarah Vines about chasing with me. It became apparent that there could be two waves of severe weather, one in the morning and one in the afternoon. I actually only got one or two hours of sleep overnight Thursday. I stepped out of the house before sunrise and it was obvious that a warm front had drifted north and moved over my location in Huntsville. Temperatures were already warming before daybreak. Scattered showers were breaking out. These were mostly elevated and not very strong. By 7 a.m. I was loading and preparing my vehicle for the chase. I was expecting a call from Jason, but my phone never rang. I found out later that my Droid X was malfunctioning. More on that later. Showers and storms by this time were mostly training from southwest to northeast from Franklin and Marion counties, across Lawrence, Morgan, and Limestone, west of Huntsville. By 8 a.m. I was getting interested in a cell back in West Alabama. We were not under a watch and there were no warnings. What intrigued me about that cell was its shape on radar. It wasn’t large, but it seemed to be encountering some shear and I thought that if it developed more, it may become dangerous. I decided to drive toward Decatur to intercept it. It was probably over an hour away from Decatur when I decided to leave Huntsville. I left home around 8 a.m., believing I had plenty of time to purchase gasoline and snacks at Kroger. Never get behind me in line at the grocery store. I waited for what seemed like 20 minutes for a lady with multiple WIC vouchers and not enough money to purchase the amount of food she loaded in her buggy. I am usually pretty patient, but my patience was really being tested then! Finally I got out to the vehicle and fired up my live video stream. This time I used a headset microphone for the audio. I got some feedback from Barry that it was much better than Wednesday. I texted Jason. He said he had tried calling me but that it had gone straight to voice mail. I had several phone issues through the day. It froze, wouldn’t accept calls, wouldn’t allow me to send outgoing texts, and randomly opened apps. It also got to a point where it would not charge, even though it “said” it was charging. This proved very frustrating, especially during the morning. I was receiving multiple incoming texts and calls. Unfortunately, it is impossible to respond to most of those when chasing, even when the phone is working. I drove to the marina on the Tennessee River, on the north side of Decatur. The storm I had earlier thought showed potential did, in fact, turn severe to my northwest. I decided to watch it from a distance at the river. It was initially warned for a severe thunderstorm. The cell split. The lead cell started rotating and the NWS Huntsville upgraded the warning to a Tornado Warning. That was a very good call. The storm produced a tornado that touched down on the south side of Athens. That tornado stayed on the ground across Limestone and Northern Madison County. It produced low-end EF3 damage. I decided to drive north on U.S. 31 and follow the rear storm. As I drove north toward that storm, it was being warned for a Severe Thunderstorm Warning. I pulled off U.S. 31 in the southern part of Athens, close to Athens Country Club to watch the storm. I didn’t know that I was within a few hundreds of yards of where the first storm dropped a tornado. As I started videoing this storm, the NWS Huntsville issued a Tornado Warning for it. I saw rotation and very strong updraft winds under what appeared to be a developing wall cloud. I was sending live video of this back to WHNT 19, which I believe they used on the air. Unfortunately I did not save any of their coverage on my DVR between 9 and 10 a.m. 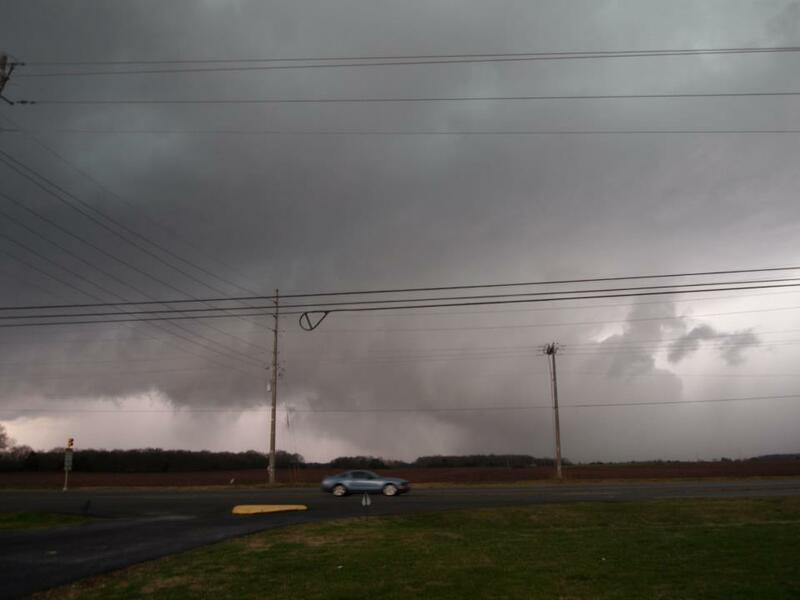 This storm produced the second tornado, an EF2, in Madison County. I hope that the video and reports being relayed from my location helped people “upstream” from the storm take it seriously. I was on the phone with Jennifer New, a trained storm spotter and chaser from South Georgia. She was providing radar support and helped me relay reports to the National Weather Service. WHNT 19 Tornado Coverage 3/2/12 10-10:15 a.m.
During this part of the chase I was alone in the car. That makes it much more difficult. I decided to drive back toward Madison County. I was hoping to send WHNT some live video of the damage but I was getting conflicting reports of where the damage occurred and never found it. Complicating matters, the power was out in Athens and other points east on U.S. 72. This is a high traffic area and since street lights were out, it was very slow going. I made it back to Huntsville and stopped at the Krispy Kreme on North Memorial Parkway. Sarah was on her way north from Jefferson County to join me for the remainder of the day. While I waited on her, I made an executive decision to order three delicious and delectable glazed doughnuts and a large coffee. I had not eaten breakfast and it was getting close to midday. I had planned on having breakfast on my way to Decatur, but the lady in front of me at the grocery store used up any spare time I might have otherwise had! The doughnuts were awesome! When Sarah arrived, she had to get her equipment loaded. She is an amateur radio operator. She has a magnetic mount roof antenna. She also had her own laptop with radar. We decided to drive to Buckhorn High School to look at the damage there. We parked there and walked around. There was significant damage to two homes near the school, numerous large trees uprooted and snapped, and a large concrete power pole was blown over. Amazingly, a mobile home was virtually untouched despite the fact it was surrounded by all of this other damage. After walking around the area, we got back in the car to prepare for the rest of the day. I posted some damage photos on my blog and sent live video out of the damage. I saw Andy Kula, Meteorologist with the NWS Huntsville arrive on the scene. He and another NWS employee were already out doing a storm survey. Those folks at the NWS Huntsville are really on top of things! We also had a chance to speak with WHNT 19 Chief Meteorologist Jason Simpson about the afternoon weather and chase plans. At this time there were only a few showers developing in West Alabama. Temperatures had risen to near 80 degrees. Our thoughts at that time were to head back toward the area where I-65 and I-565 intersect. I also spoke to John Brown who was now on I-65 driving north. He decided to stop in Cullman. After spending a little more time at Buckhorn High School, we drove west on Winchester Road back toward U.S. 231 (Memorial Parkway). By the time we got to the Parkway, storms were rapidly intensifying in Northwest Alabama. Instead of driving southwest toward I-65 and I-565, I decided that we should drive north on US 231 toward the Alabama – Tennessee state line so that we could intercept storms that would be moving in that direction. That was a good call, because we would see three separate tornado-warned storms between 2 and 4 p.m. in southern Lincoln County Tennessee and northern Madison County. The first storm we witnessed from U.S. 231, just north of the state line in Tennessee. This storm produced some amazing features, including a rotating wall cloud, cloud to ground lightning from the wall cloud, a possible funnel cloud, and a very large and well-defined “beaver tail”. As we followed this storm east on highway 275 in southern Lincoln County, we were able to see a second tornado-warned storm follow on the heels of the first one. The wall cloud was not as impressive from our vantage point on the second one. Sarah did an excellent job relaying these reports via ham radio and to various sources back at WHNT. WHNT meteorologists Jason Simpson, Ben Smith, and Brandon Chambers provided extensive coverage of these storms. They frequently used our live stream along with radar to describe what was happening in the storms. I also did a phone interview with Jason, describing what we were seeing. While we were in Lincoln County, we were stalked. Yes, stalked! Back when we were parked at Buckhorn High School, 30 miles and 45 minutes away, a lady came up to our vehicle and asked whether we were storm chasers. She thanked us for what we do and then proceeded to ask several questions, including if we gave paid tours! Well, little did we know, she followed us all the way up to Lincoln County. When we were parked and looking at the second wall cloud, Sarah told me to look behind us. Sure enough, it was the lady we saw back at Buckhorn. Fortunately after we pulled up a little further, we didn’t see them again. 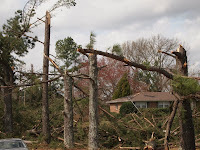 WHNT 19 Tornado Coverage 3/2/12 2-4 p.m. 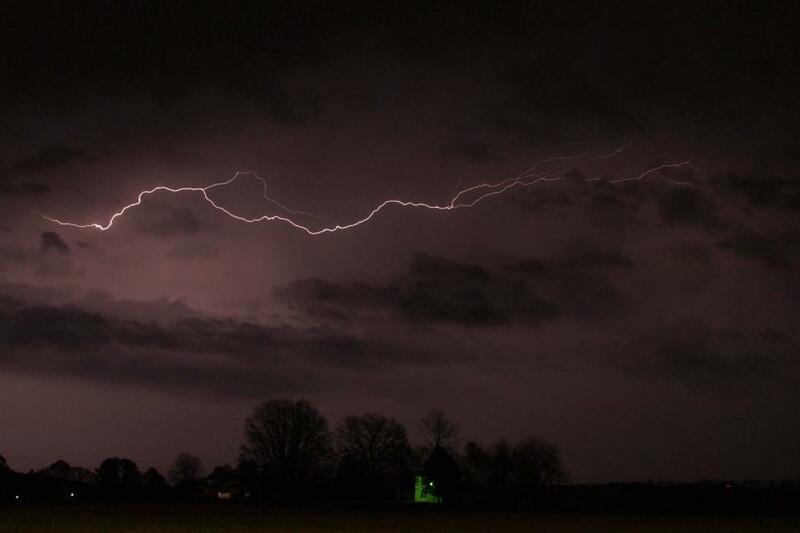 Meanwhile, storms continued to develop in some of the same areas in Northwest Alabama. A severe storm moved out of Colbert and Lauderdale counties and was moving into Limestone. This storm showed signs of rotation and large hail. We decided to drive a little south on U.S. 231 near Hazel Green to cover this storm. I think I was initially a little too far north. We had a good view, though, of a wall cloud. As it approached, it had the appearance that it was possibly producing a rain-wrapped tornado. We reported it as such; “possible” being the key word. I decided we needed to play it safe and drive south. As we were doing that we experienced quarter-sized hail. It was a good decision to drive south. If the storm had produced a tornado, our original position would have not been safe at all. That is why it is always good to keep watching the sky and always have an escape route. Of course, ideally, it would have been better if we had been further south all along. After the storm passed we drove up and down 231 and saw no damage. Other than snacks and doughnuts, we still had not had a chance to eat. We had even stopped at the McDonald’s drive thru twice in Hazel Green. Both times we gave up on them because the line was long and the service was slow. Radar seemed to indicate that there was now a lull in the storms in the areas that we could access in time to see storms. We considered going further north to intercept a storm in Tennessee. Then we considered intercepting a storm near Arab. Stopping to eat, traffic, and a train in Huntsville made that impossible. We finally decided to drive to Falkville in Morgan County. 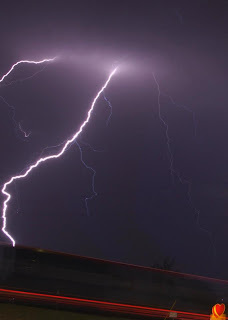 There we saw several strong thunderstorms move through which produced an amazing lightning show after the sunset. Photographing lightning after dark is always a great way to end a successful day of chasing. I drove back to Huntsville to take Sarah to her car. It was an interesting day. I saw four storms that produced confirmed tornadoes along their path. Both cells I saw during the morning in Limestone County produced tornadoes. One of the cells in Tennessee produced a brief tornado and the cell I saw in Hazel Green had produced a brief tornado back in Limestone County. 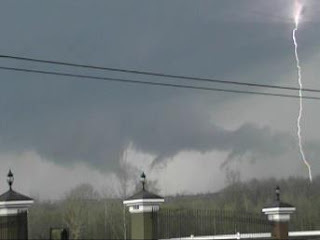 We saw some amazing cloud structure, and most importantly we were able to communicate storm reports to the NWS Huntsville and provide live video coverage for WHNT 19. I sincerely hope that the efforts we made helped heighten awareness and aided in the overall warning process. Even though the area experienced four tornadoes (EF0, EF1, EF2, and EF3) it was great news that there were no fatalities in the area.